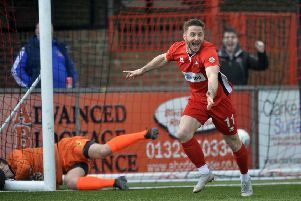 Eastbourne Borough are through to the FA Cup fourth qualifying round, but boy did they make it tense for themselves. Jamie Howell's men went into the break 4-0 up and seemingly cruising into Monday's draw. But 10-man Dulwich Hamlet made a good fight of it scoring three second half goals. Alfie Rutherford gave Borough the lead after five minutes before Ryan Hall doubled the lead on 16 minutes. Dean Cox made it 3-0 from the penalty spot before Hall got his second. Three goals in the last 11 minutes made it tense for Borough but they hung on.